John William’s storied career has spanned over five decades, and given his recent output, the maestro shows no signs of stopping anytime soon, at least as long as Steven Spielberg keeps making movies anyway. One of the best ways to get a grasp on an analysis of William’s career is to break it down into mini-eras that can be linked together by a set of stylistic tendencies and motif preferences. One such mini-era spanned the time in between Star Wars/Close Encounters (1977), and Raiders of the Lost Ark (1981). During this time period Williams did some of his greatest work, composing scores that include “The Fury” (1978), “Dracula” (1979) and of course “Superman” (1978). 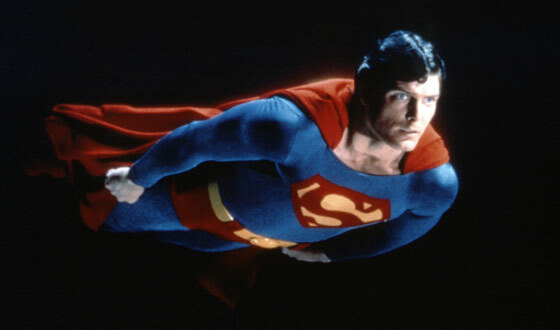 Most fans would not include “The Empire Strikes Back” (1980) in this group, but there is an undeniable similarity between “Superman” and “Empire” in the use of a rapid fire brassy action motif and a similar structure to the action material in general. The best album representation of the musicfrom the “Superman”, that is readily available and will not require you to pay a fortune, is the out of print but still easy to find 2000 Rhino 2-disc release. Yes, there are a few sound issues in spots where music sounds more compressed than it should, but overall it is a terrific re-mastering of the music and is packed with alternate cues and a ton of previously unreleased music. The packaging and cover art are gorgeous. There is not space here to properly review this landmark soundtrack, but here are a few of the highlights of this must own historic album. Disc one opens with a “Prelude And Main Title March”, one of the boldest statements of the Superman theme ever presented. In “The Planet Krypton” the majestic Krypton theme presented in its full glory and along with the next track “The Destruction of Krypton”, contain unreleased dramatic and suspense material that is reminiscent of some of William’s avant-garde work on the 1960s “Lost in Space” television series. One of the great joys of this Rhino release was getting to hear “Death of Johnathan Kent” for the first time outside of the film. This powerful, emotional, cue highlights the Americana section of the score and is followed by the dramatic and deeply moving “Leaving Home”. The combination of these two cues stand as one of the countless, unforgettable highlights in the maestro’s storied career. William’s works both the Krypton music and the Americana motifs to start off “The Fortress of Solitude” before taking the listener into a rousing sonic journey of spooky suspense music, mysticism, wonder, and dramatic triumph. This cue alone would leave most composers bragging for years. It is a magnificent track that features moments of such emotional depth and sublime beauty it can only be described as pure glass. Williams would return to this style of composing many years later in “Always” (1989) and “A.I. Artificial Intelligence” (2001). Then we get to the muscle of the score, and when it comes to action material, “Superman” stands alongside the best of John Williams. The previously unreleased “The Big Resue” is the real highlight here. This is the track that contains the previously mentioned rapid fire brassy action motif that would be used by Williams in the “The Empire Strikes Back”. “The Big Rescue” is a wickedly exciting piece of classic action music that ends in a full-fledged orgasmic burst of heroic triumph as the main theme soars lifting the listener into the stratosphere of sonic bliss. “Superman”, like all of John William’s music, is a soundtrack that will make you feel. Of course there is the wonderfully constructed, ever hum-able, “The March Of The Villains”, a cue that still stands as one of the most fluid pieces of comedic music ever composed for a soundtrack. And oh, yes, there is that love theme, and what a love theme it is. The previously unreleased “The Terrace” sets up “The Flying Sequence”, a soaring musical masterwork that can only be described as magic. The music from “Superman: The Movie” was effectively re-worked by conductor Ken Thorne for the outstanding “Superman II” and then again for the woefully pedestrian “Superman III”. 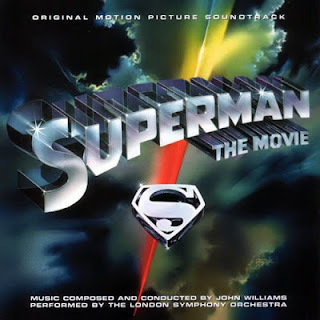 “Superman: The Movie” is such a vast and varied a treasure trove of dramatic music, it is an irresistible source of inspiration and entertainment that stands as one of the all-time must own classic soundtracks and is arguably a top ten John William’s score.